BREAKING NEWS!! 32,601 badgers killed in this year’s badger cull. The 2018 cull in all areas is now over! Stay vigilant though. The official cull may be over, but illegal persecution takes place year round. So wherever you are, if you see anything untoward, let your local badger or badger protector group know about it. Welcome to our website. Our site will enable you to read our monthly newsletters, discover what we do and how to get involved. Our site also gives contact details for other groups around the country. Somerset Against The Badger Cull is a year-round campaign that aims to raise awareness of the issues surrounding the badger cull, locate setts and help protect Somerset’s badgers. 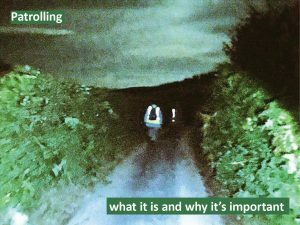 During the period of the cull, it runs Somerset Badger Patrol to enable people to make a powerful, but peaceful protest against the badger culling policy. It also helps to save badgers simply by being in the cull zone. We started our opposition to the badger cull in 2012 in the hope that the preliminary badger culls in West Somerset during 2013 would stop before they began. Since then, we have worked successfully during the subsequent culls of 2014 to 2017. In this time, we have saved countless badgers as well as lifting the lid on the chaos, unscrupulous behavior and criminal activity that occurs during and after each cull period. Take some time to explore the site to learn more about the issues and how you can get involved. Stand up for badgers, conservation and science!